Reports: Adrian Peterson's 2-Year-Old Beaten, "Not Expected To Survive"
Adrian Peterson's 2-year-old son—not Adrian Peterson Jr., but a formerly "secret" child—is "not expected to survive his injuries," and could be taken off life support tonight, City Pages reports. On Wednesday, the Sioux Falls boy was allegedly beaten by his mother's boyfriend, Joseph Robert Patterson, 27, who has been charged with aggravated assault and aggravated assault on an infant. Update, 5:30 p.m.: The boy has passed away. According to a reporter covering the story, the initial confusion surrounding the boy's identity was due to the fact until recently, Adrian Peterson wasn't even sure the child is his, though Peterson's father later would later describe the boy as a grandson. It was initially reported by TMZ this morning that Adrian Peterson Jr., Peterson's oft-photographed son, was hospitalized in critical condition. City Pages disputed that account, citing a source claiming the boy was not Peterson's. TMZ amended its account to say the boy was Peterson's son, just not Adrian Peterson Jr. City Pages followed suit. A reporter whose own outlet isn't going with the story yet tells us this is a separate child, one not publicly known. The mother is a Sioux Falls woman who moved from the Twin Cities soon after the child was born, and believes the boy might be Peterson's, though no paternity test was done. (City Pages claims one was conducted recently.) The reporter also says Peterson has no contact with the woman or the child. Via the Argus Leader, EMTs arrived on Wednesday afternoon to find a child suffering from injuries that an examination found were "consistent with abuse," according to a police spokesman. TMZ added that the boy was initially unresponsive, and suffered head injuries. Our reporter tells us the child is on a ventilator, and City Pages says he's expected to be removed from life support. According to police, the relationship between Patterson and the boy's mother was "fairly new," and they had just moved in with him. Patterson is scheduled to appear in court later this morning. Peterson missed practice yesterday, and was reported to be in Sioux Falls attending to a "very serious medical issue involving a family member." He's back at the Vikings practice facility today. TMZ reports that Adrian Peterson's 2-year-old son remains in critical condition, after allegedly being abused by his mother's boyfriend. 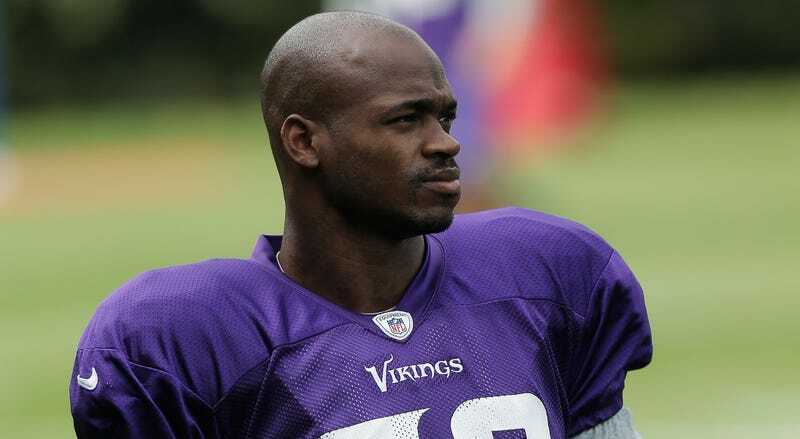 Peterson has left Vikings camp and traveled to Sioux Falls to deal with the situation. Via the Argus Leader, EMTs arrived on Wednesday afternoon to find a child suffering from injuries that an examination found were "consistent with abuse," according to a police spokesman. TMZ adds that Peterson Jr. was initially unresponsive, and suffered head injuries. Joseph Patterson was arrested on charges of aggravated assault and aggravated battery of an infant. Peterson missed practice yesterday, and was reported to be in Sioux Falls attending to a "very serious medical issue involving a family member." He's apparently back at the Vikings practice facility today.